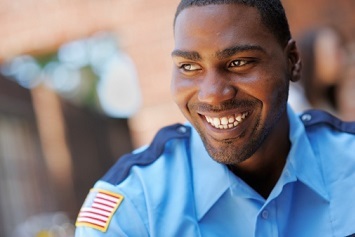 Security officers are the “brand ambassadors” of any security guard company, since they visually represent the firm the entire time they are on post or at the client’s site. As such, they need occasional reminders about their visibility and accessibility to employees working at the client site who want information, access, support, and protection. Can you actually train security officers to provide better customer service, or is it something you must assume they already know during the interview process? It’s both; it’s important to hire a potential officer with the experience and capacity to provide good service to the company’s clients who will be willing to listen to new suggestions for better service through training classes or orientation sessions. Here are five key customer service training points that can serve as useful reminders for new or current security officers as they consider how to do their jobs with both a service orientation and a policy-and-procedure perspective. Note the interconnected nature of these concepts. 1. Be the client’s problem solver. 3. Bend the rules when the situation calls for it. 4. Make the first and last 30 seconds count during the beginning and end of any interaction.